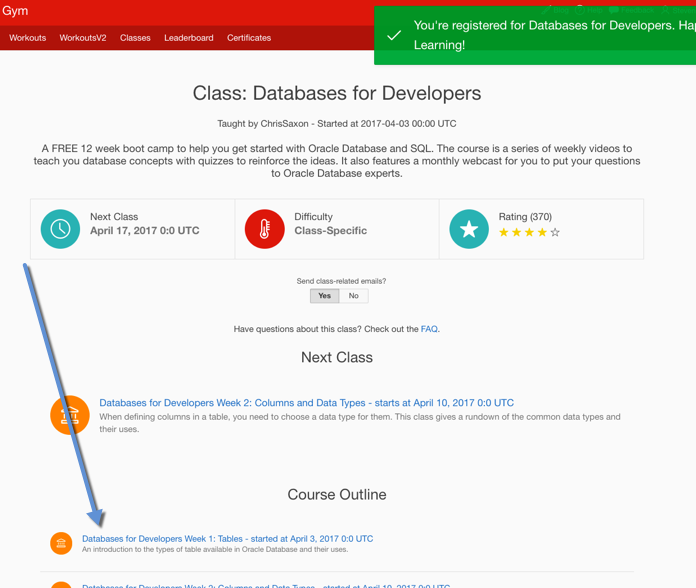 Databases for Developers class on Oracle Dev Gym: take it any time! Chris Saxon, a Developer Advocate at Oracle, has put together a 12 week "bootcamp" introduction to SQL. Each week consists of a short video, plus 3 quizzes. You probably won't need more than 30 minutes to complete them. Every fourth week, Chris will be on a live webcast to answer questions. While there is a start date for each new class, there is no end date. This means that you if you missed the beginning week or two (or seven! ), you can still register for the class and take the earlier classes. To do this, visit the Oracle Dev Gym (for which you will need an Oracle account). Then go to the Classes page in one of two ways, shown below with the blue arrows. Click on Databases for Developers, then click on the Register button. You can then pick from any of the weeks in the Course Outline that have already been started, and work your way through them. We hope you enjoy, and get lots out of, the Databases for Developers course! And while you are at the Dev Gym, be sure to check out our weekly tournaments as well our library of over 2,500 quizzes on SQL, PL/SQL, Database Design, Oracle Application Express and Logic!